What is the oldest thing in your house? How different is it today from when it was new? Whether it’s a beloved chair, piece of silver, family heirloom or painting, chances are it shows the wear and tear of generations. The object has a history and all of the happy or unhappy accidents, re-varnishings, scars or well-meaning repairs reveal that history (for better or worse). In America, the history of most objects goes back a few hundred years. In the Old World, that time frame is extended. I first learned this lesson buying a table in Italy. The nice man who sold it to me explained in the slow and simple Italian he uses to speak to a five year old (since he readily knew I would understand little else) “This table is only a little over a hundred years old, it is not an antique.” I nodded like I understood but my definition of old was suddenly and forever revised. I thought about these things the other day when I was able to see a set of early 15th century panel paintings, owned by the Museum of Fine Arts Boston, that are now in the midst of a fascinating restoration. The long wooden panels are part of an altarpiece that may have been created in Venice or in Southern Italy (on the heel of the boot in Puligia) by painters and craftsman from either Crete or Venice (or both). The Monopoli Altarpiece found its way to Boston to decorate the home of Dr. & Mrs. Elliot Hubbard in the early 1900’s. It was gifted to the museum in 1937. 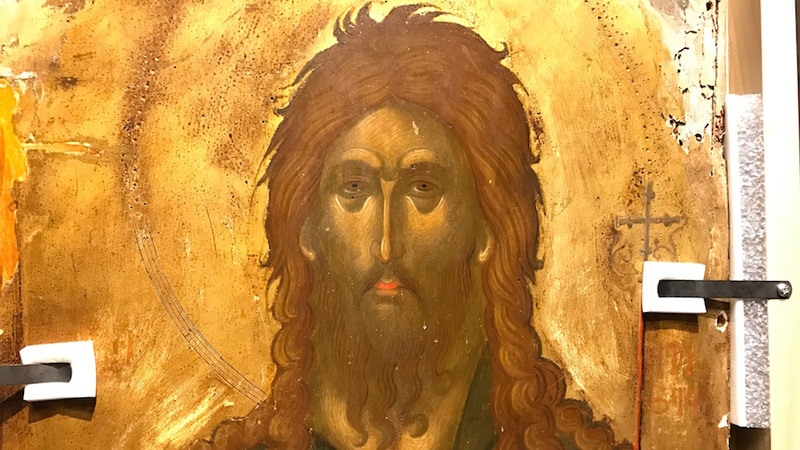 Dr. and Mrs. Hubbard must have loved collecting Byzantine art because they had many more fine pieces in their home that their son later gifted to the MFA and the Harvard Museums. Monopoli, Italy was a fortified Greek city and dates from 500 B.C. 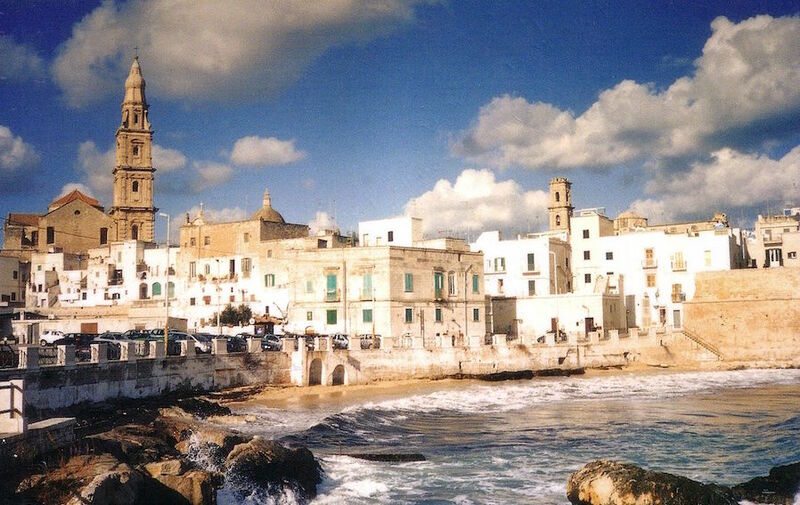 It is in the region of Bari in Puglia on the heel of the boot of the Italian peninsula. The altarpiece was created for the Church of St Stephen, in Monopoli. 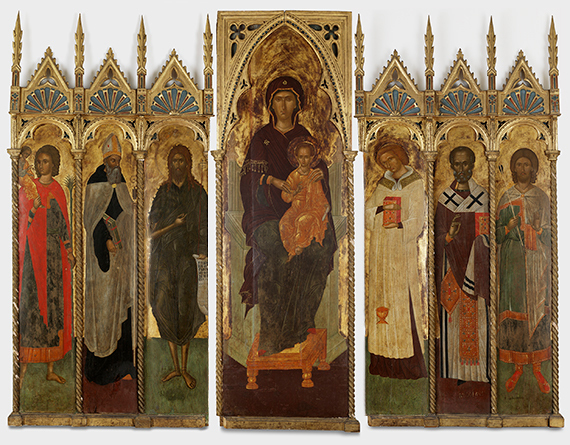 Its seven panels depict the Virgin and Child in the center flanked by the saints Christopher, Augustine, Stephen, John the Baptist, Nicholas and Sebastian. They look a bit exhausted from their long trip through time. The altarpiece shows the ravages of 500 years of worship, travel, decoration, previous restoration and undesirable framing. It is now undergoing careful examination by art scientists with vast expertise. It has been carefully disassembled, X-rayed, Infra-red photographed, chemically analyzed, microscopically examined and exhaustively catalogued. The care and precision with which this is all happening boggles the mind. Let me give you an example. 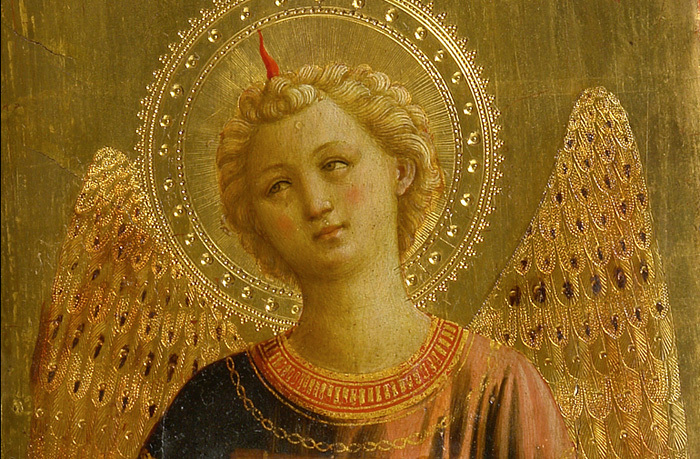 The halo around the Virgin shows the badly stained efforts of an earlier attempt at restoration. Removing this “mordant gilding” will go a long way towards restoring the beauty of the original gold leaf layer which still exists underneath. The most distracting damage, that in my mind keeps the beauty of these paintings at a frustrating distance, are the brownish brushwork stains tarnishing the golden halos surrounding the faces. When you look at something undeniably breathtaking, like a Fra Angelico, that pristine (almost trademark) golden halo creates a transparent glow that delights your eye. If you can imagine the messy brown stains, in the images below, restored to a lustrous burnished pure gold leaf flat circle, the beauty of the faces suddenly comes into focus. Turns out the gilding is in two layers; an original layer and then a newer one and those ugly stains are from varnish and oil applied over the gold from a now unsuccessful restoration. And here is where things get even more interesting. Extreme closeup shows the original gold leaf layer peeking out from the brown stains of “mordant gilding” from and earlier restoration. Thankfully this poor quality (now spoiled) layer can be removed to reveal the beauty of the original gilt which is still largely intact underneath. Close up of the panel of St. Augustine shows the partially restored gilding. 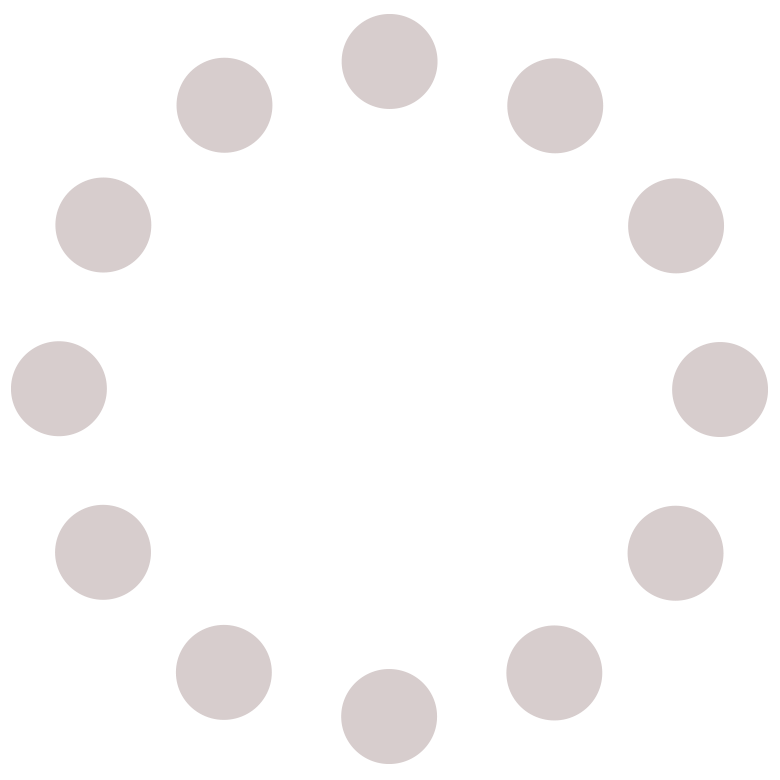 Note the effect of the perforations. The gilding of the original is called water gilding. Although the layer of gold is amazingly thin, it rests on an almost perfectly flat surface and can be burnished to a rich luster. The newer layer has major flaws. The restoration gilding has the evocative name of “mordant gilding.” Caitlin explains, this mordant gilding used some sort of sticky resin or oil (the mordant) to adhere a poor quality gold. The word mordant comes from a French word meaning “to bite”. It may have looked great at the time but now, the impurities in the low quality gold have tarnished and the resin has turned into that ugly brown sludge reminding me of unfortunate photo repairs done with now cracked and yellowed scotch tape. 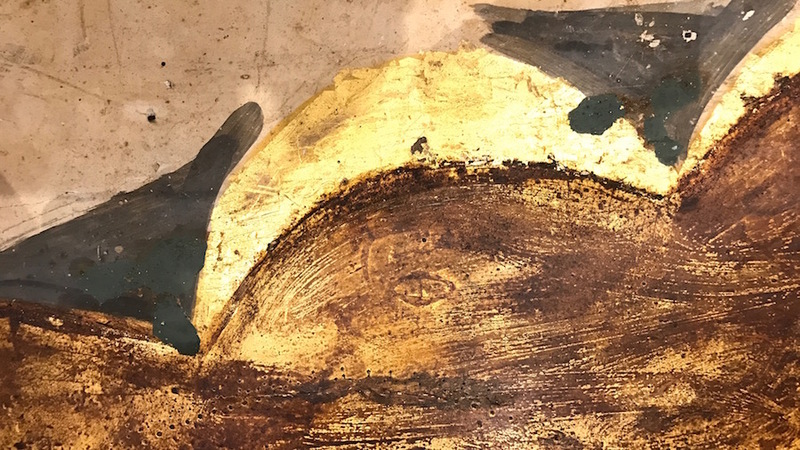 Astonishingly, it is the actually a good thing that the poor quality gilding was done “mordantly” because now, the restorers at the MFA can gently loosen the “bite” of the mordant layer, remove it altogether and reveal the underlying layer of original pure gold. What a treasure hunt this has turned out to be. The experts also looked at the backs of the paintings and discovered some intriguing tool marks. These marks, like tiny footprints from the past (think bread crumbs on the path or tracks in the snow) have led the team to a startling realization. Somewhere along the way someone switched the order of the panels. Take a look at the picture below and see if you agree? The tell-tale tool marks indicate St. Sebastian and John the Baptist swapped places at some point in the altarpiece’s journey. The plan now is to put them back where they originally stood and the art historians I spoke with felt confident that this original composition feels less awkward and more pleasing to the eye. The MFA conservation team believes this is the proper order of the panels based on tool marks on the reverse side. See that John the Baptist is now on the Virgin’s right where he normally resides and his arm points to her instead of away from her. The MFA received a generous grant from the John and Sonia Lingos Family Foundation to do all this painstaking work. God bless them. What a noble endeavor to endow. In these cost-conscious times where museum budgets are in jeopardy and the Arts go begging for support it is gratifying to know work like this can carry on. It raises some interesting questions about the goals of restoration? Is the idea to make the Altarpiece look new? Should that be the goal or should they leave well enough alone and just let the object be in all its imperfect glory? Is original condition somehow better than seeing the battle scars of 500 years? 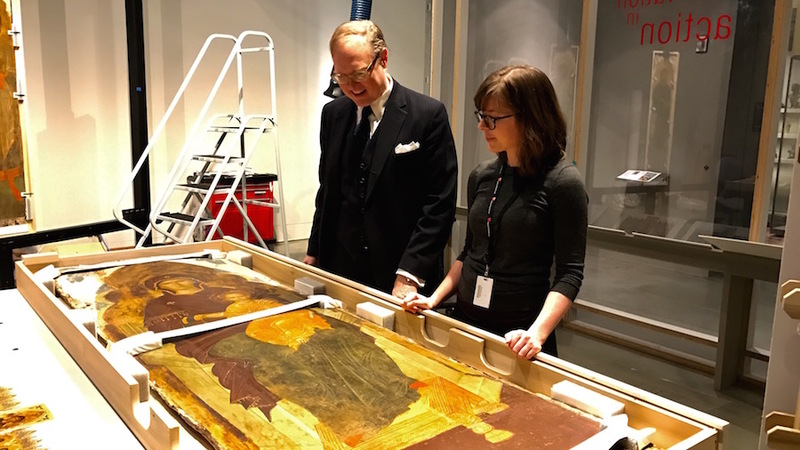 Dr. Frederick Ilchman, the MFA’s Chair, Art of Europe, and Caitlin Breare, Assistant Conservator, overlook the central panel of the altarpiece. In this case, the poor quality 19th century frame, the flawed repairs, the wrong panel positions and countless other issues hide the beauty of a masterpiece with the veil of well-meaning but ultimately unsound restorations. Current best practices in the Restoration Arts mandate everything done to alter the work of art should be able to be undone in the future. The ugly now-corrupted mordant gilding was not done intentionally in this manner but, it just worked out happily that it can now be safely removed. 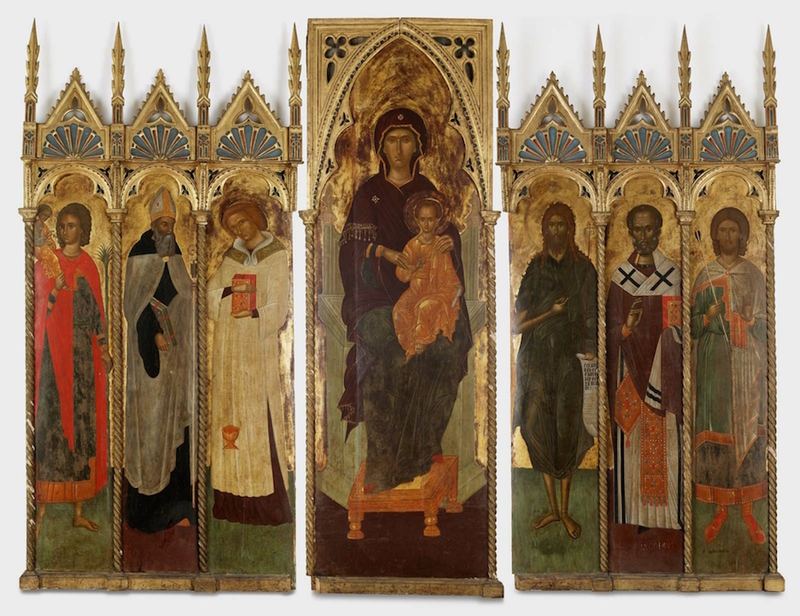 Will the restored altarpiece be perfect? Of course not. Perfection with something this old is clearly the enemy of the good. Somehow this one escaped me, but I too, love the meaning of the icons, and was very moved by Juan Bastos’ explanation of his own creation of an icon of St. Luke. I also have a story to send you, about a painting with the issue of renovation work, and the happy outcome! I love Fra Angelico! Those lovely really lucent halos, the light-enhancing filigree, are so marvelous to behold! Thanks for this wonderful piece! I love that St. John is now pointing toward the virgin, and that the tilt of the head of St. Sebastian is also toward her. Tom, thanks for the fascinating description of the conservation of the MFA altarpiece. I look forward to seeing the piece back in the gallery. Remember the controversy when the Sistine Chapel ceiling was conserved? People certainly get attached to the look of their icons. You continue to be an informative teller that provides interesting, edifying dissemination of facts. Thank you so much for sharing this fascinating story As an artist, I particularly admire the fact that works of art can be taken care and restored hopefully the way they were meant to be. Your article covers the story as always, with your wonderful vision, sensibility, knowledge and timing. 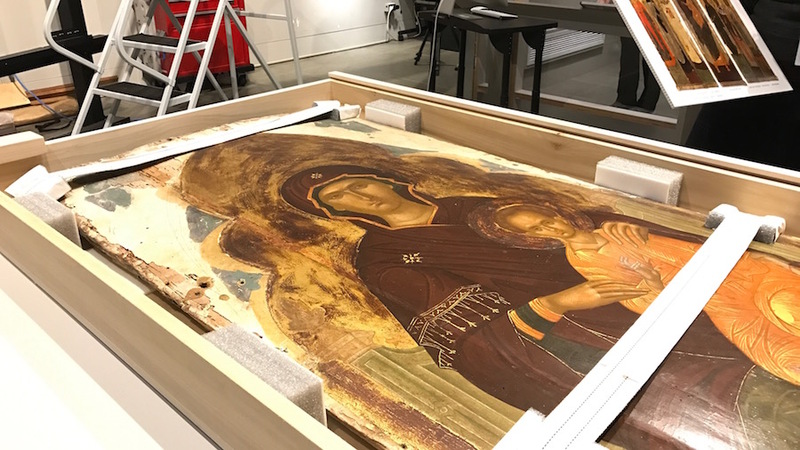 I had the opportunity to visit the restoration department at the Getty Museum (not open to the public), where I saw the painstaking process to bring back to life some masterpieces. Growing up Catholic, the religious imagery always affected me much, and I started doing my own representations of the Virgin Mary and Jesus when I was seven years old. However, in my mid-20’s I ended up doing a triptych depicting St. Luke (Who is the patron of artists, doctors, and is known for having done the first portrait of the Virgin Mary). I chose a stranger who in my mind had the right look for the portrait. The saint was in the middle while on the sides I depicted a portrait of the Virgin Mary with a palette and brushes, and on the other side the symbol of the bull, for the medical field. The background had real gold leaf in the three panels. 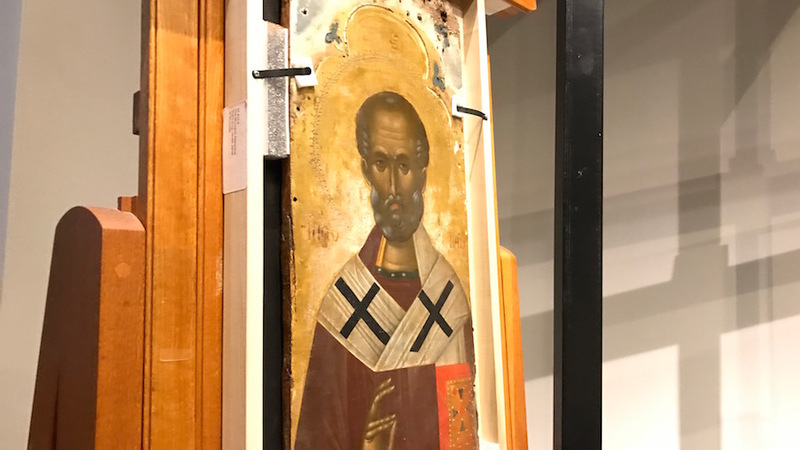 What I found fascinating about painting an icon, I discovered a few months later, was when I went to visit it at its new home, the St Luke’s Episcopal Church in Baltimore. As I entered the church, I saw a woman kneeling praying to the saint I had created. This experience touched me, and whenever I see icons now, I not only get the satisfaction to see a beautiful piece of art, but also I imagine the origins of the birth of these works. Thank you Tom for another terrific story. Greetings from down under Tom! In Australia until March 31st, and this mourning I delighted in reading your terrific blog. Restoration is clearly tricky business that can go horribly wrong if done by inexpert folk. Your blog not only informs us of this but it givesme especially another good reason to visit Boston and the Museum of Fine Arts. Keep on writing…your blogs make my day! Thanks Tom- That was beautiful and informative and it makes me want to come to Boston to see the finished work. Thanks for your gorgeous blog. Best to you and Catherine. Very interesting project. I have encountered similar situations with gilding while working on the High Altar of the Church of San Francesco della Vigna in Venice while on a Save Venice grant in 2000. The altar had at least five restoration from the 16th century thru the 20th century. Various tests through the various layers revealed the original gilding , and as in the case of this painting, it was far superior in purity, and also thicker from hand beating, creating an incredible luster that isnt seen these days. In the end it was decided to restore the altar to the 19th century restoration, which was certainly not the most beautiful, but the least risky as it was very uncertain what of the original surfaces remained underneath, and it would have been a disaster to take off all of the previous work to find almost nothing of the 16th century to work with. So the decisions of a restoration and to what level are very difficult to arrive at. One must be very thoughtful and do extensive research. The beauty of this alter piece transcends its condition and even the narrative context of the subject matter. Part of its modern appeal is that it continues to speak to us from the distant past. The marks of its “time travel” should not be completely obliterated for this reason (in my opinion). The distractions caused by unsound restoration should be negated when possible, but I like that restoration will not try to take it all the way back in time. Our contemporary eye appreciates the authenticity of age.